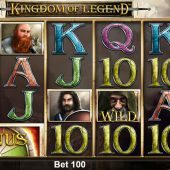 Kingdom of Legend slot is not your usual basic mono-feature Novomatic slot. It has a 40-line 5 reel 4 row format with a Mythology theme, and first impressions reminded me of Yggdrasil's 'Vikings Go Berzerk' slot with the war-like characters and powerful musical overtures in the background. Instead of coins for the lower-value symbols though, Kingdom of Legend has the standard card symbols. The characters are all singly-stacked except for the highest-paying Princess with the pointed ears which is stacked 4-high on all reels. 5-of-a-kind of Princess Pointy awards 12.5x stake so essentially a full screen would pay 500x stake. The card symbols all pay the same for 5 (which is unusual) at 5x stake. There are single Wilds on all reels with no multiplier. There is a random in-play feature where the character Orc in his most violent axe-swinging form appears on the reels and will award a random cash amount of up to 500x stake or the main feature, the Bonus Wheel. The Bonus Wheel is usually triggered with scatters in an odd way - one half of it appears on reels 1 and 2 plus reels 4 and 5. It is two rows high and to trigger it you must land them flush to each other so they form a complete 2x2 square image of the wheel, either on the first two or last two reels! Should you get both wheels you get two separate bonuses. The Bonus Wheel has cash awards of up to 30x stake, free spin quantities to a maximum 10 or a visit to the 'Super Wheel' and you spin it until you hit 'COLLECT'. Should you hit free spins, these are played immediately with the same reel set but with the enhancement of any Wilds appearing as expanding Lightning Wilds which will turn one or more adjacent symbols wild too. You then return to the Bonus Wheel. The Super Wheel awards a no-lose spin paying 50 to 500x stake should you land on it while on the Bonus Wheel. You are paid this and then go back to the wheel for another spin. It is thus possible to win multiple prizes before you hit the dreaded 'COLLECT'.